Tonight, I fully appreciated how much KILZ painting my mom and uncle did for me last week. It’s not all that exciting. 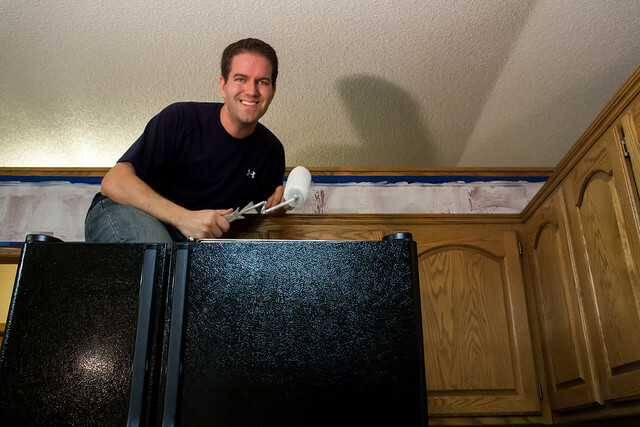 That is, until I ended up on top of the refrigerator and decided it could be a fun photo. I set up my trusty tripod with a 10-second delay, scrambled up the ladder (out of the frame) and leaped into position with my paint roller and posed for a continuous shutter of 10 pictures at a time. I don’t know who was more difficult to work with: the photographer or the model. An experienced photographer can set up the shot right away. Well… I probably shouldn’t admit to how many times I climbed that ladder to pose for the camera. It was at least 10 times, and I say “at least” because quite frankly, that’s when I stopped counting. By the time I got the shot I wanted, I hardly even needed a ladder. I practically high jumped into position, like a cat being chased up a tree. This entry was posted in General, People by Joe Curry. Bookmark the permalink. I love seeing all these latest pics from your new house! It looks like you are your family are doing a lot of hard work; I can’t wait until we can see the finished result. Keep up the good work! Joe, so fun to see glimpses of the new place. Will definitely look you up this fall when I am up in Minnesota visiting my dad.